This is how the birth of Jesus Christ came about. When his mother Mary was betrothed to Joseph, but before they lived together, she was found with child through the Holy Spirit. Joseph her husband, since he was a righteous man, yet unwilling to expose her to shame, decided to divorce her quietly. Such was his intention when, behold, the angel of the Lord appeared to him in a dream and said, "Joseph, son of David, do not be afraid to take Mary your wife into your home. For it is through the Holy Spirit that this child has been conceived in her. She will bear a son and you are to name him Jesus, because he will save his people from their sins." All this took place to fulfill what the Lord had said through the prophet: Behold, the virgin shall conceive and bear a son, and they shall name him Emmanuel, which means "God is with us." When Joseph awoke, he did as the angel of the Lord had commanded him and took his wife into his home. As we rapidly approach the end of our Advent journey to Bethlehem, we pause for a visit to Nazareth with St. Joseph. God’s grace flows like a powerful river, and it floods the house of “a righteous man” and prepares him for a most important role as the earthly head of the Holy Family. This brief detour in Nazareth is riveted with drama and meaning because we hear that Joseph makes plans to divorce Mary quietly. The sacred Scriptures do not give us Joseph’s rationale for this decision. Perhaps Mary had not communicated the whole story to Joseph, especially regarding the Holy Spirit, and he is making a decision without knowing the whole truth. Or, maybe Joseph is overwhelmed by humility and does not feel worthy of the enormous responsibility of serving as the foster father to the Son of God. Or, it could be that he does not yet have the faith to accept the truth that Mary was indeed overshadowed by the Holy Spirit and carrying the word-made-flesh in her womb by a unique act of grace. For whatever reason, the carpenter makes plans to divorce Mary. Our Father in heaven has a different plan, so He sends an angel who encourages St. Joseph to fear not and to take his wife, Mary, into his home. God personally calls Joseph this night to take a critical role in the marvelous plan of His saving work. God asks Joseph to be a husband to Mary, a foster father to Jesus and custodian of the Holy Family. 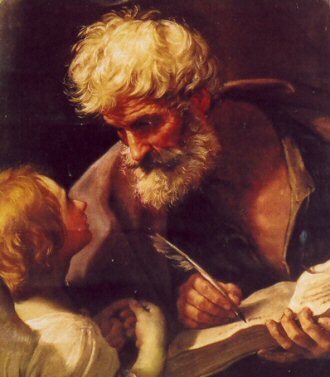 By God’s grace and the goodness that resides in his righteous heart, Joseph is obedient to God’s call. He does as the angel commands; he takes Mary under his roof. (Lord, I am not worthy that you should enter under my roof …). God’s plan proves to be wise, loving, grace-filled and precious beyond comprehension, and Joseph was privileged to be a part of that plan. This great response to God’s grace takes place just a short time before the moment that would change the history of mankind for all eternity — the moment when the Virgin shall “bear a son, and shall name Him Emmanuel.” God is screaming to the whole world the importance of family. Mary needs a husband. Jesus needs a foster father. Joseph needs to fulfill his call to paternity according to God’s plan for him. Jesus would spend the next 30 years of His life preparing for His public ministry in the simple home of Nazareth where sacrificial love, humility, poverty of spirit and prayer were exalted and modeled. Obedience is a door to grace, a wide-open door. On that fateful day, Joseph had other plans that were very reasonable from a human perspective. God had something else, a perfect mystery, in mind. By surrendering his will to the will of the Father, Joseph began a journey that would bring him and the world true joy, peace and eternal happiness. This Advent, let’s pray to the Father and beg for the grace to imitate Joseph and his obedient heart. Let’s beg for the grace to trust that the Father’s perfect plan for our lives will bring us real happiness and an abiding sense of fulfillment, not offered by plans we develop on our own. Let us prepare for unexpected, unimaginable surprises from the Lord along the way. St. Joseph, spouse of Mary, guardian of the Holy Family, obedient son of the Father, pray for us.